Many, many moons ago a young Mad Meat Genius took a driving test at the Oakland branch of the Department of Motor Vehicles. Fast forward and now every Sunday, in the parking lot of this D.M.V. the ‘Temescal Farmers Market’ takes place. Things sure have changed in the old neighborhood. A working class predominately Italian community has been transformed into a yuppie wonderland. This market is a showcase of high end vegetables and food products. Today we found, a new to us, chile pepper called Shishito. 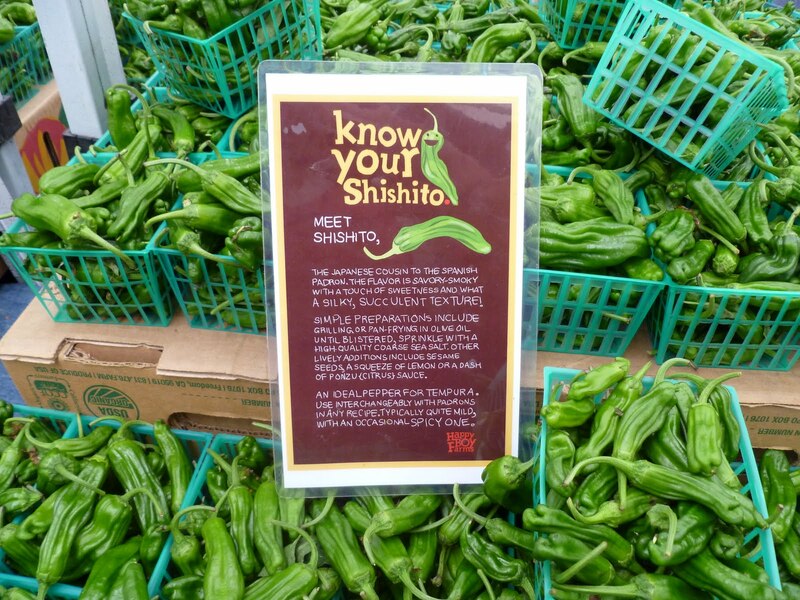 It is a funny name for the pepper that claims to be a Japanese cousin to the Spanish padron. We could not resist. 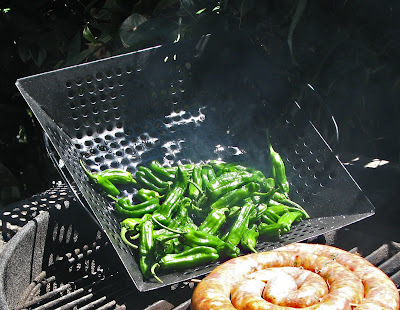 To be honest I am not all that familiar with the padron pepper. People rave about their flavor. A simple sautéing in olive oil and dressed with salt is the consensus of preparation. Of course we will have our Chilebrown twist to this process. Our peppers will be oiled and salted but they will be grilled over a hot mesquite fire. We just blistered the oiled peppers and dusted them lightly with a sprinkling of sea salt. Yes, these peppers are delicious. We picked them up by the stem and plucked them in our mouth. They were slightly sweet with a smoky flavor from the pepper and the fire. I did not notice any heat but did experience a fresh vibrant green pepper flavor. What ever you want to call these peppers they are yummy. A favorite Japanese restaurant prepares these Tempura style and puts them in the Katsudon I crave every 30 days or so. Sounds like my kinda pepper - mild! :-) I'll have to check out that market one of these days. I kinda like yuppie stuff. @Greg, love the animation on your Cookie Monster alter ego! Gonna get me one of those baskets. You cooked them just right! Too bad there are no stealth heat bombs now and then, like with padrons. Greg, Tempura would be perfect. Next time. Zoomie, Yours and mine kind. I loved the flavor. Greg, I am going back to make tempura that Greg suggested. cookiecrumb, Temescal market may be more Yuppie than Marin. Marin does not have a doggy valet. I've not heard of these peppers before. The look delish! I'd love to find some around town, but we're seriously into Hatch fever here at the moment. I'm not sure anyone's got anything else. Zia, You are lucky to have Hatch peppers. We will only get them for a couple of weeks here. Fire roasted peppers are just the best. Love that smell and the taste is robust.